(CNN) -- Serena Williams suffered an early exit at the Madrid Open on Monday when she quit her opening match against Francesca Schiavone with a recurrence of knee trouble. 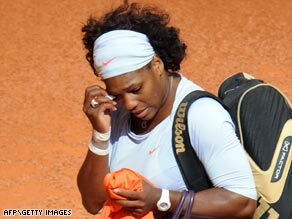 Serena Williams slips away after quitting her first round match at the Madrid Open through injury. Australian Open champion Williams, seeded second behind Russian Dinara Safina, made the decision to withdraw after losing the first set 6-4 against her Italian rival. The 27-year-old Williams said the knee had been bothering her for a few weeks but should not affect her participation at the upcoming French Open. "No, it's not going to stop me from playing in Paris," said American Williams. "I didn't want to risk my chances to play Roland Garros." She added: "I wanted to do well (here), but at the end of the day I'm trying to play Paris and still trying to play singles and doubles there so I didn't really want to take that chance and be out of Roland Garros." Israel's Shahar Peer also pulled out when trailing 5-4 against Danish ninth seed Caroline Wozniacki having also retired during the first set of her semifinal at the Estoril Open. In other early matches, former world number one Amelie Mauresmo knocked out Ai Sugiyama 6-2 6-4 and Daniela Hantuchova ousted Gisela Dulko 7-6 6-1. Eighth-seeded Russian Nadia Petrova came from behind to defeat Germany's Anna-Lena Groenefeld 4-6 7-6 7-6 in their second round showdown. In the men's action, ninth seed Jo-Wilfried Tsonga reached the second round after defeating former world number one Marat Safin in straight sets. Frenchman Tsonga, who lost to Roger Federer in the third round last year in what was his first appearance at the event, won 6-4 7-5 to set up a meeting with wildcard Ivan Ljubicic. Ljubicic beat Teimuraz Gabashvili 6-3 6-2 while Tsonga said: "I'm happy with my game. I played great tennis, offensive tennis. I place some good serves, some good volleys and I was really aggressive, so I'm happy." Aside from Tsonga, the two other men's seeds in early action at La Caja Magica were also successful, with number 11 Stanislas Wawrinka crushing qualifier Marco Crugnola 6-2 6-0 and number 12 David Ferrer beating Guillermo Canas 6-2 6-2.